4722 ✉ 122PFXIV 20 Pfg. 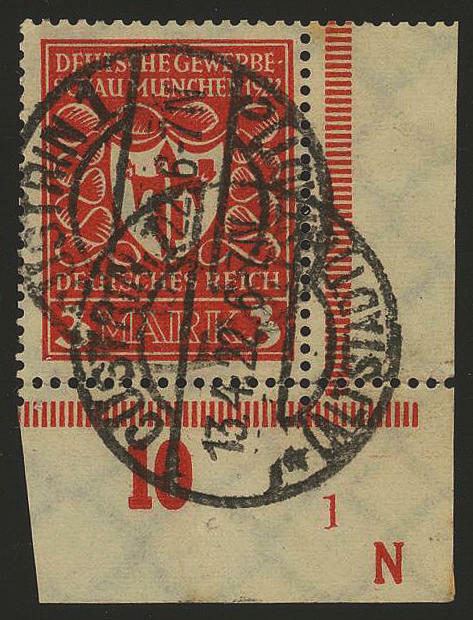 Bavaria farewell with scarce plate flaw \"vertical white line from Elbow to to the lower margin\" in the horizontal pair with normal stamp se-tenant, minimal patina, on commercial letter from \"Munich 4. November 20\" in the local usage to the Editorship of th Munich newspaper. Michel 700,- €. 4723 137IUDD 10 Mk. 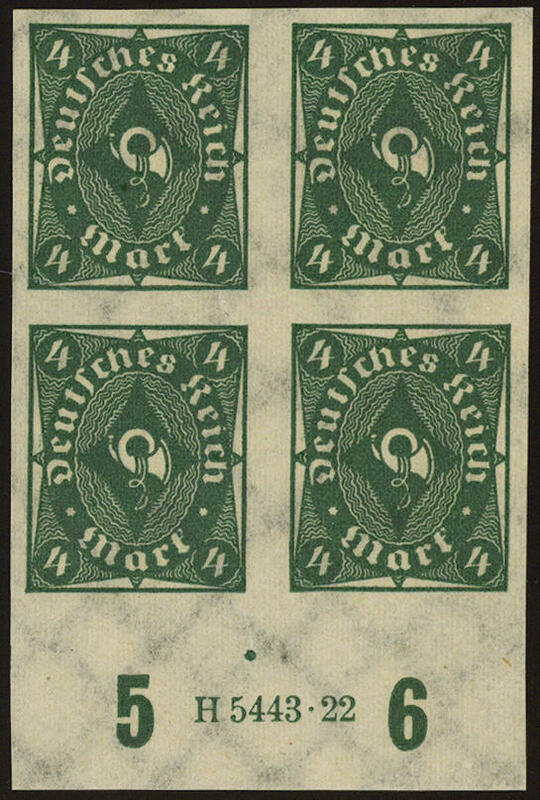 Bavaria farewell, type I with double overprint unperforated and additional variety \"HORN\", slight storage traces, otherwise in perfect condition mint never hinged very attractive and scarce variety. Due to missing offers in the Michel special catalogue only noted without price! Photo expertize Dr. Oechsner BPP. 4724 Farewell issue 1920, 15 special prints full designs of the Lord Prof. Engels with not supposed drawings in mixed colours / denomination value, in perfect condition on ungummed paper, cut. Interesting set! 4725 147PFä 60 Pfg. 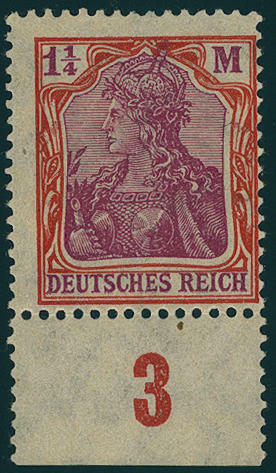 Germania, the so-called \"Cologne postal forgery\" as worse lithography unwatermarked, perforated L13, fresh colors and in perfect condition mint never hinged from lower margin, without any signs. 4726 ✉ 150 1 Mk. 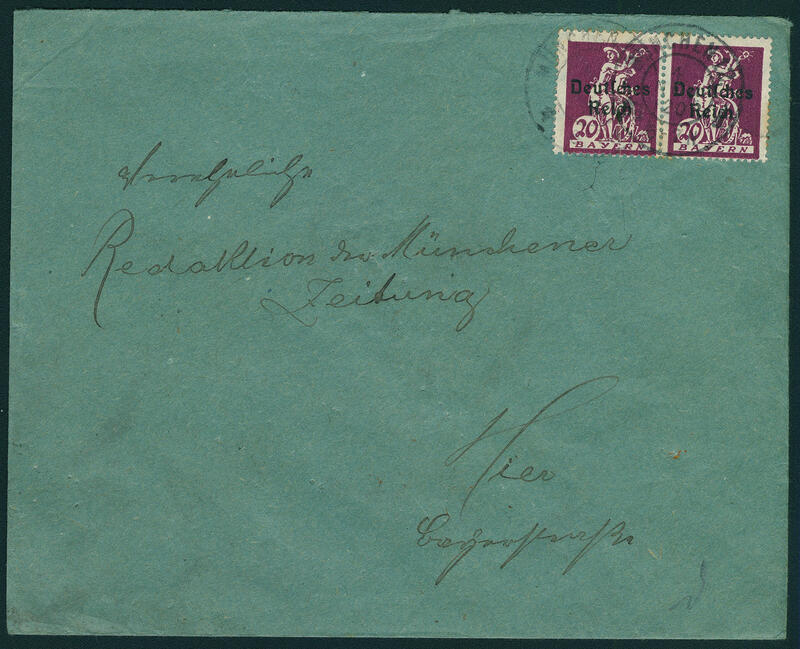 Germania, vertical strip of three, to the margin fixed, on card from \"TIENGEN 9.10.22. 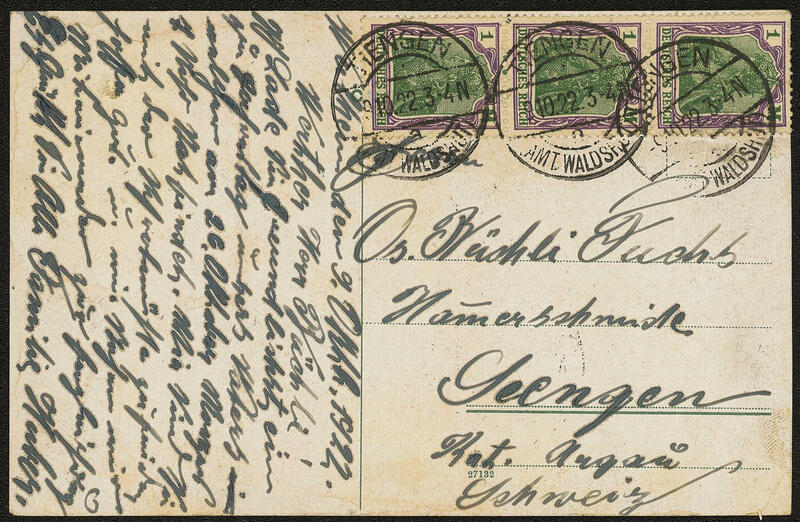 \" to Seengen / Switzerland as correctly franked border rayon use! 4727 151Y 1 ¼ Mk. 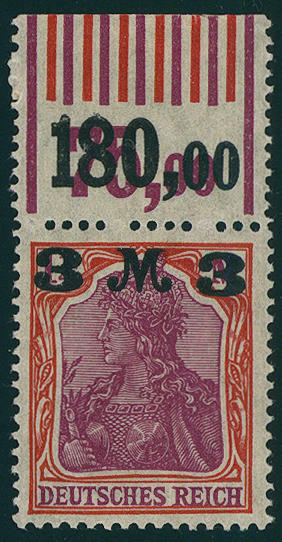 Orange red / dark carmine purple with scarce watermark \"quatrefoils\" from lower margin, fresh colors, and very well perforated, in perfect condition mint never hinged an outstanding quality of this rare issue, the especially in mint never hinged condition rare offered becomes. The scarce watermark is here also in the lower margin already on face good to see. Photo expertize \"mint never hinged and perfect\" Tworek BPP. 4728 154IIb 1, 60 M. On 5 Pfg. 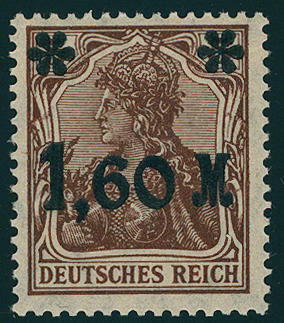 Dark brown, overprint dull-black, very fine deep colored, fresh colors and in perfect condition mint never hinged, without any signs. Photo expertize \"mint never hinged and complete flawless\" Dr. Oechsner BPP. Michel 1200,- €. 4729 155IIa/PFIV 3 Mk. On ¼ Mk. 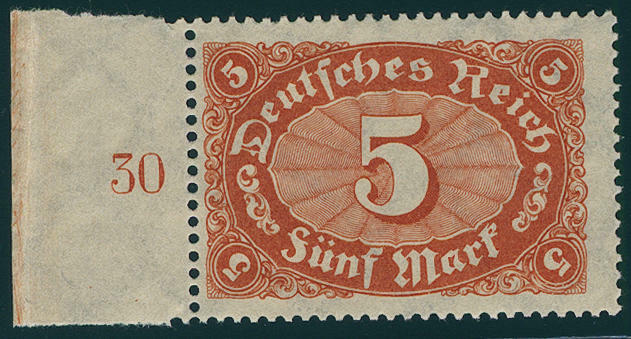 Orange red, blunted overprint, variety \"right numeral of value 3 in the overprint deeper standing\" from upper margin in the rotary printing with configuration \"0 ´6 ´0 / 1 ´5 ´1\", unfolded, fresh colors and in perfect condition mint never hinged, hinge trace only in the upper margin, without any signs. In this kind as upper margin copy very rare! Photo expertize Dr. Oechsner BPP. 4730 159b 10 Pfg. Black olive, fresh colors and very well perforated, in perfect condition mint never hinged, expertized Dr. Oechsner BPP. Michel 200,- €. 4731 ⊙ 181 30 Pfg. 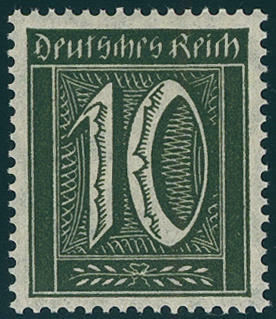 Numeral watermarked waffle, fresh colors and neat cancelled, expertized Infla / Berlin, Oechsner BPP. Michel 420,- €. 4732 189Uu 150 Pfg. 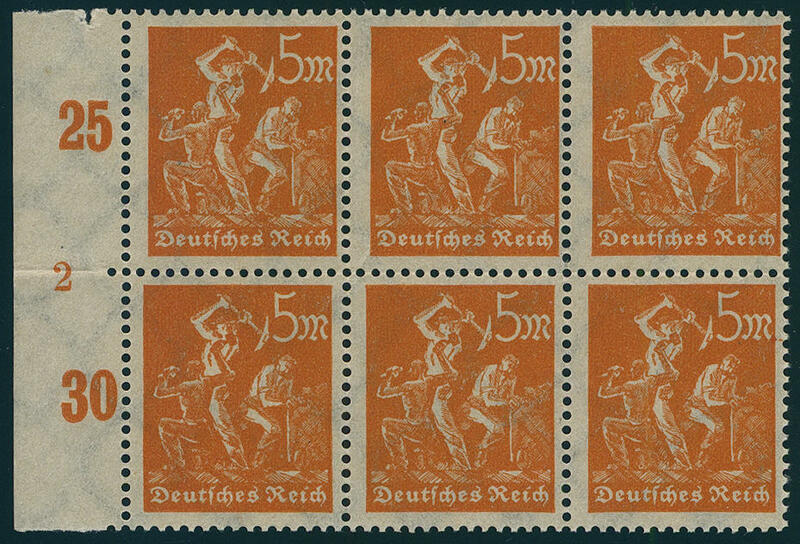 Orange, vertical pair from lower margin, lower stamp at the bottom unperforated, in perfect condition mint never hinged up to now unknown, new discovered variety, also in the Michel special catalogue unlisted and possibly unique! Expertized Infla / Berlin. 4733 194b 5 Mk. 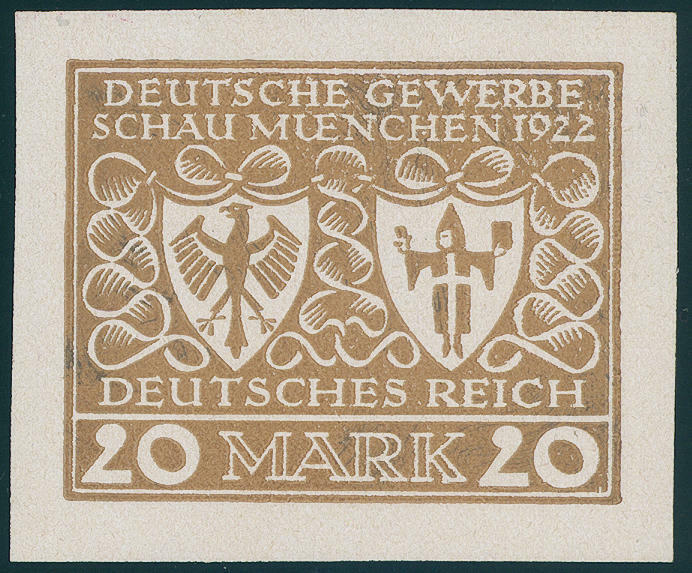 Brown orange, watermark waffle, fresh colors and very well perforated, in perfect condition mint never hinged from left margin of sheet. An especially nice copy this extraordinarily rarely colour, without any signs. Photo expertize \"genuine and immaculate\" Winkler BPP. 4734 196DD 20 Mk. 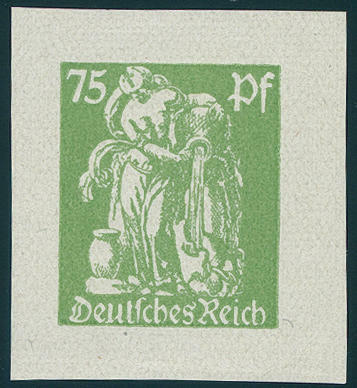 Pflüger with double background, wonderful fresh colors, very well perforated, in perfect condition mint never hinged in utterly perfect condition, without any signs. An extraordinarily scarce variety! Photo expertize Bechtold BPP. Michel 3500,- €. 4735 ⊙ 201DZ 3 Mk. 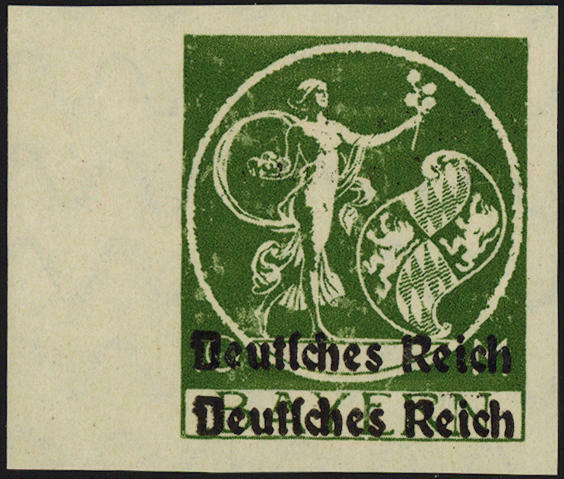 Trade show Munich 1922, right lower corner of the sheet with printer sign \"N\", small faults, used \"GÜSTRIN 13.4.22. \". In this kind very rare! Photo expertize Weinbuch BPP. 4736 204Entwürfe 20 Mk. 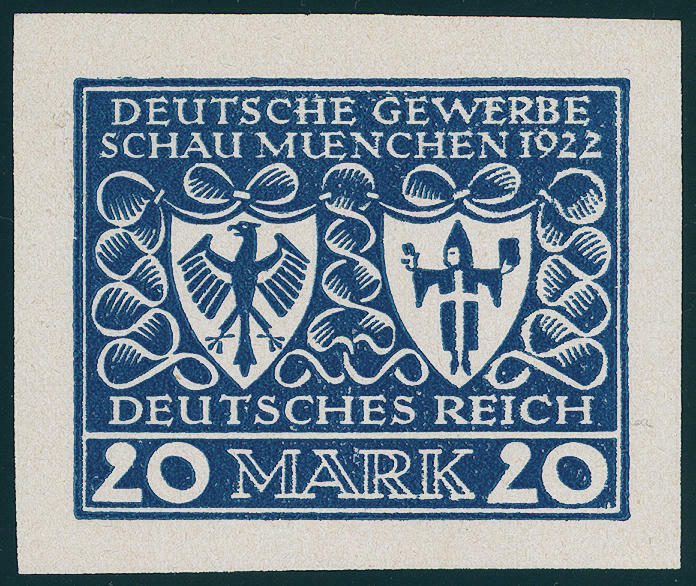 Trade show 1922, six designs to the trade show Munich 1922 from Prof. Ehmke, unperforated on ungummed art paper in the colours black, carmine, grey, green, blue and ochre. It is a matter herewith about trial proofs the Empire printing office to the competition from the year 1921. Scarce set! Photo expertize Ludin BPP. 4737 ⊙ 209PY 50 Mk. 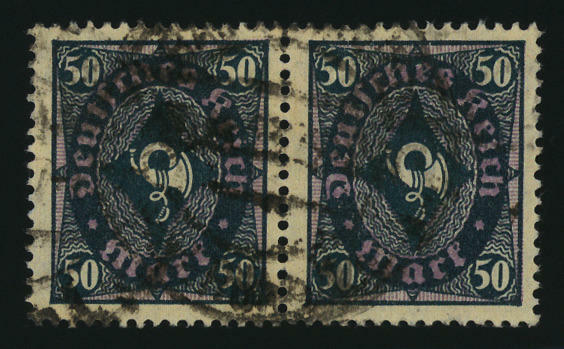 With scarce watermark quatrefoils, horizontal pair, neat cancelled \"Bad Homburg\", inflation rarity, photo expertize Bechtold BPP. Michel 2200,- €. 4738 226aUHAN 4 Mk. 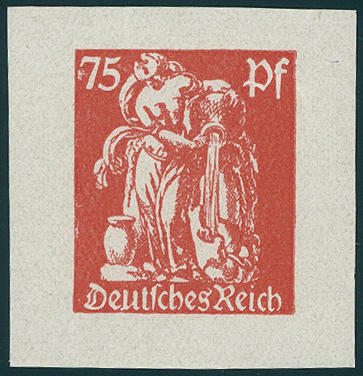 Posthorn 1922, unperforated block of four from lower margin with house order number \"H5443.22\", unfolded, in perfect condition mint never hinged, without any signs. In this kind by Michel unlisted and possibly unique! 4739 226aUZW 4 Mk. Posthorn, horizontal strip of three with gutter, unperforated, in perfect condition mint never hinged, in the gutter as usual folded. 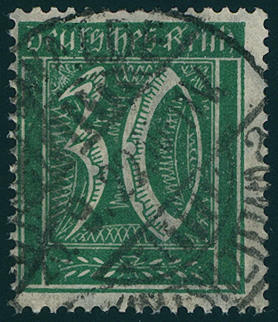 Extremely scarce variety. In this kind by Michel catalogue unlisted and possibly unique! 4740 238z 5 Mk. 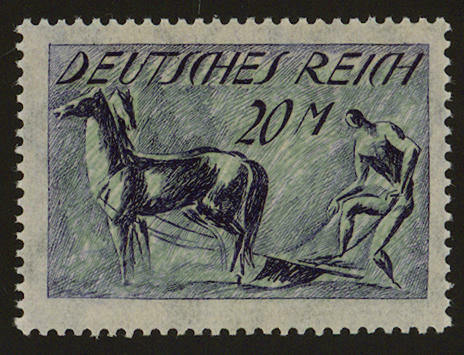 Worker on cardboard paper, block of six from left margin of sheet with plate number \"2\", horizontal perforation prefolded, all stamps in perfect condition mint never hinged, expertized Infla / Berlin. Michel 180,- €. 4741 ∆ 245 50 Mk. 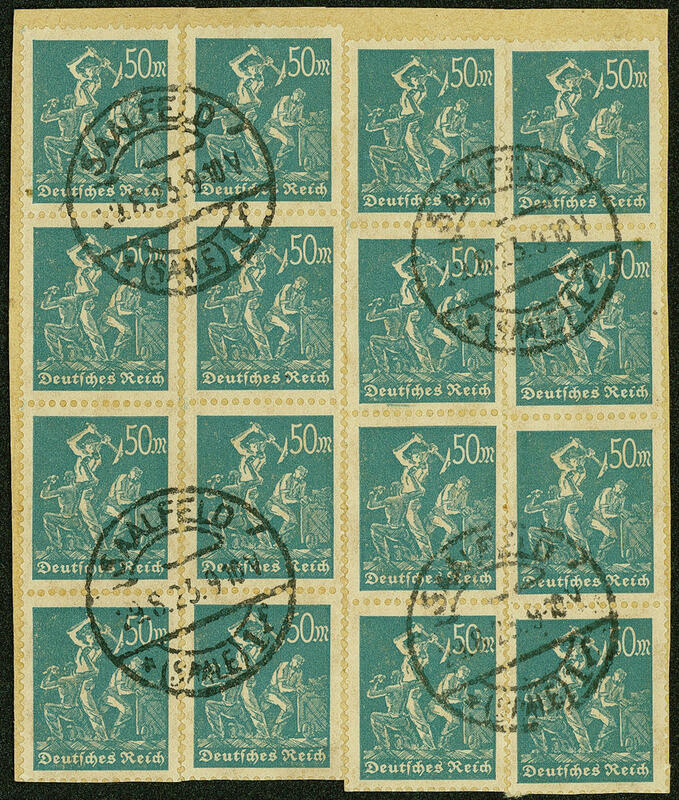 Bluish green, four vertical strip of four as impressing multiple franking on piece, in perfect condition, especially nice canceled \"Saalfeld 29.8.23. \", a Honor for the advanced inflation special collection! Photo expertize Gaedicke BPP. Michel 2400,- €.